Christ shows up in the most unexpected places---in the wisdom of a stranger, in the breaking of bread and even in those moments when all hope seems lost. That is one lesson from Luke 24:13-34, the only detailed account of Jesus’ post-resurrection walk to Emmaus. The risen Christ travels about seven miles from Jerusalem alongside two grieving disciples. The two already know the testimony of the women at the empty tomb, but they fail to recognize their teacher until he joins them for a meal. 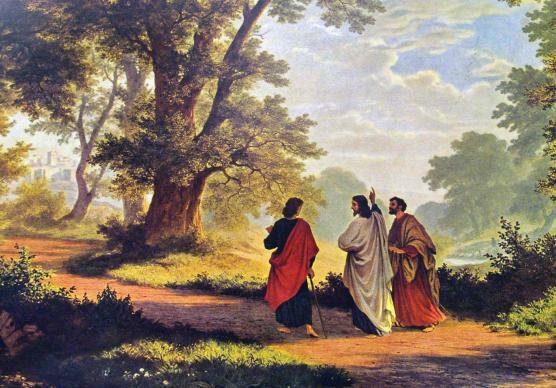 “The Road to Emmaus,” an 1877 painting by Robert Zund. Here is another lesson from the story: A Christ encounter tends to get people up and moving. After Jesus reveals himself, the disciples rush back to Jerusalem with a fervor that the strangely warmed heart of John Wesley would recognize. “Weren’t our hearts on fire when he spoke to us along the road and when he explained the Scriptures for us?” the two say to each other. The familiar Bible story remains cherished Easter reading and, in fact, is one of the possible lectionary passages for this Easter Sunday. The account also provides the name of the Walk to Emmaus movement, a ministry of ecumenical spiritual retreats organized through The Upper Room at United Methodist Discipleship Ministries. Click here to read more of the article, "Walking with Christ" at www.umc.org. This feature was originally published on March 22, 2016 by the United Methodist News Service. Heather Hahn is a reporter for United Methodist News Service. Contact her at (615) 742-5470 or newsdesk@umcom.org. Click here for more about the Walk to Emmaus.